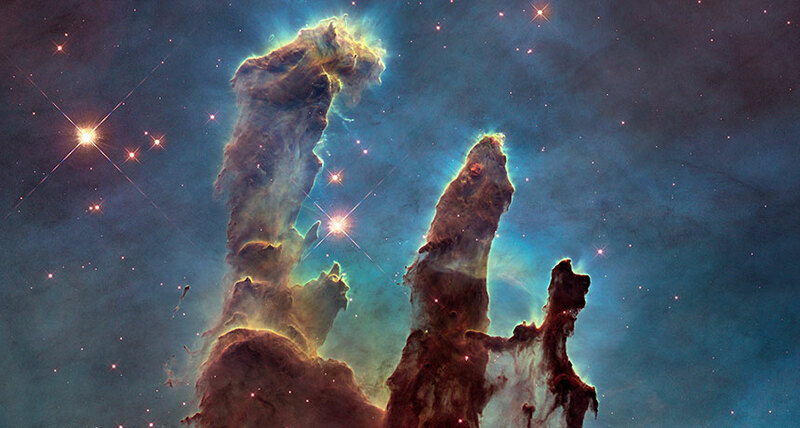 PILLAR OF STRENGTH Columns of cosmic gas and dust dubbed the Pillars of Creation (shown in this image from the Hubble Space Telescope) may be propped up by an internal magnetic field. The Pillars of Creation may keep standing tall due to the magnetic field within the star-forming region. For the first time, scientists have made a detailed map of the magnetic field inside the pillars, made famous by an iconic 1995 Hubble Space Telescope image (SN Online: 1/6/15). The data reveal that the field runs along the length of each pillar, perpendicular to the magnetic field outside. This configuration may be slowing the destruction of the columns of gas and dust, astronomer Kate Pattle and colleagues suggest in the June 10 Astrophysical Journal Letters. Hot ionized gas called plasma surrounds the pillars, located within the Eagle Nebula about 7,000 light-years from Earth. The pressure from that plasma could cause the pillars to pinch in at the middle like an hourglass before breaking up. However, the researchers suggest, the organization of the magnetic field within the pillars could be providing an outward force that resists the plasma’s onslaught, preventing the columns from disintegrating. The team studied light emitted from the pillars, measuring its polarization — the direction of the wiggling of the light’s electromagnetic waves — using the James Clerk Maxwell Telescope in Hawaii. Dust grains within the pillars are aligned with each other due to the magnetic field. These aligned particles emit polarized light, allowing the researchers to trace the direction of the magnetic field at various spots. “There are few clear measurements of the magnetic fields in objects like pillars,” says Koji Sugitani of Nagoya City University in Japan. To fully understand the formation of such objects, more observations are needed, he says.